Just like the famous blankets with tags whose name we cannot mention, only better! They're made with fun prints that kids and adults LOVE! 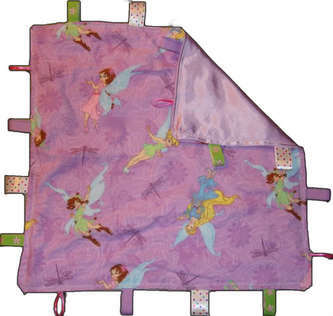 Tinkerbell and Friends Snuggle Blanket is made of PRE-SHRUNK cotton flannel with coordinating purple satin on reverse side. Flannel background is of various shades of purple with flowers and dragon flies on it. Tinkerbell and friends float, flit and flutter across it. 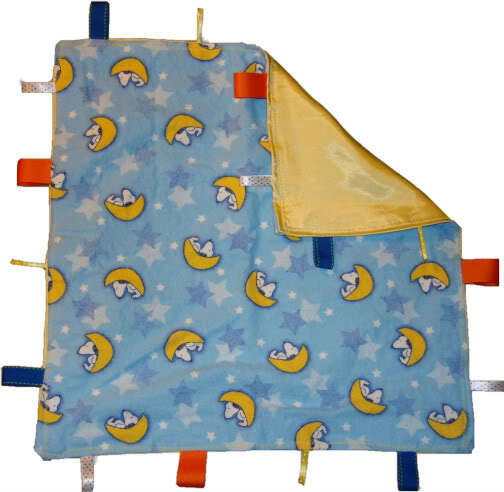 Snoopy Snuggle Blanket is made of PRE-SHRUNK cotton flannel with coordinating yellow satin on reverse side. Flannel has a light blue background with stars on it. 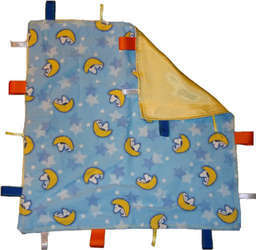 The foreground of the fabric has Snoopy lounging on crescent moons. It is approximately 16x16 inches not including the ribbons. The ribbons each stick out approximately 1.5 inches. 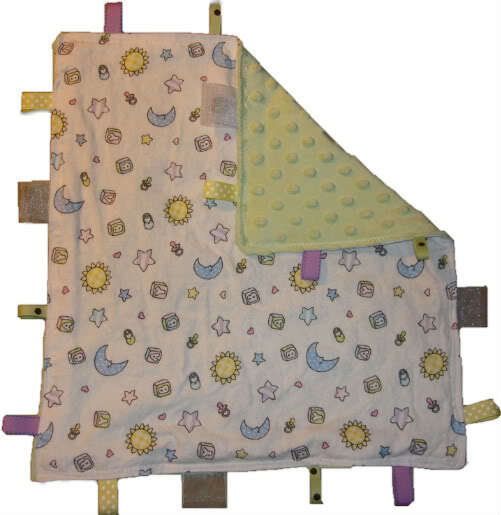 Blanket is made out of PRE-SHRUNK cotton flannel with coordinating super soft, green MINKY DOT material on reverse side. 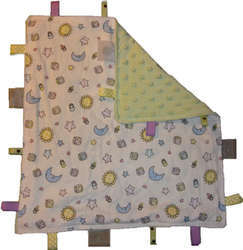 Flannel has a white background with moons, suns, stars, hearts, binkys and blocks that have the letters b a b y. Colors are blues, purples, yellows, greens and a few pinks. It is approximately 17x15.5 inches not including the ribbons. The ribbons each stick out approximately 1.5 inches.